As with any piece of equipment, the sum of all the parts often exceeds the whole. This is especially true when it comes to prices for parts. In addition to the high cost of replacement parts that might be available though the manufacturer, machinery rebuilders are also often faced with another dilemma- Some parts are simply no longer available. This double whammy has led many woodworkers to take an approach that is often overlooked- the application of a little Yankee Ingenuity. This piece is an attempt to describe the tactics this author used to make a piece usable until actual parts could be located or, in some cases, to provide what actually turned out to be an "upgrade" from parts that were originally supplied with the machinery. The best source for replacement knobs and levers is actually from other machinery. While it is unethical to go into a machinery showroom and remove items from the display models. It is even more reviling to go to your buddy’s shop and take them from his gear. It is completely acceptable, however, to dive into the boxes and bins that can be found in tag sales, flea [markets, yard sales, and close-outs across our nation each and every day. These knobs run the usual five cents to one dollar and sometimes may include a half dozen similar gizmos, all for one money. Collect ‘em all. They don’t eat much, and take up very little room. A knob you find today for 50 cents could be the knob you’ll need for a future machine or perhaps even a jig you might cobble together tomorrow. If you need it tomorrow, it’ll run you 20 time what you paid today plus cost you a trip to town. Another advantage to having a surplus of knobs and levers is that the more you have on hand, the more flexible you might be in developing these replacement strategies, and the more creative you can be fabricating your missing parts. Do not overlook the junk pile at your neighbors’ curb either. That exercise bike, the office chair, and the burned-out trolling motor are often chock-full of parts that may come in handy one day. Again—the more you have on hand, the easier it is for that mental light bulb to come on in your head. In addition to these ready-to-use parts, you’ll need a cache of hardware to rebuild your missing tooling. Hardware that lends itself to fabrication include the following items. 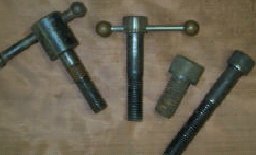 Stripper Bolts & Socket head Cap Screws- from a mill supply house, mail-order, used tool dealer or flea market. These are black-oxide finished, hardened, and expensive if you must buy them retail. They come with an Allen socket head and knurling on the outside of the head. Some come with countersunk-style heads as well. Collect them early! Acorn Nuts- local lumberyard or hardware store. Probably not from the big chains. These are a great way to dress-up your work. Ready-Rod Connectors- also from local lumberyard or hardware store. Large diameters lend themselves to many solutions. Jumbo Wing Nuts- Plumbing supply house—where your plumber shops. These guys run about thirty cents for a 5/16 to 3/8 threaded hole. A great buy! OEM Knobs and Nuts- Metal, plastic, metal insert, etc. From OEM suppliers. Links will be provided below. Sometimes these are the best solution. My lathe's tool rest base was missing the lock bolt that secures the tool rest in position. A new part was going to be pricey and would take a week to arrive. No problem. Using a stripper bolt or a socket head cap screw that will fit the threads in the tool rest base, a hole was bored through the bolt’s head and a 3/16 x 3" rod was slipped through. The original part had swaged ends to keep the rod from falling out of the hole. It was much easier to take two brass balls that used to be ends on a lamp pull-chain, bore a 3/16 hole halfway through them, and affix then on to each end of the 3/16 rod with a little CA glue. Silver solder would work as well, but I didn’t have any on hand at the time. The parts have been in service since 1984 with no problems. 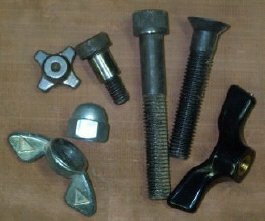 Since then, a replacement locking bolt was found at a local flea market, but the fabricated part is continuing its service. The lathe’s tailstock was also missing its locking lever. For this item the replacement’s birth began with a carriage bolt that fit the tailstock’s threads. The carriage bolt was slipped through a scrap lever from my collection. Another lathe I own uses a lever from a stationary bike. Look for something dressy, as this is a visible part of the machine that will be handled quite often. 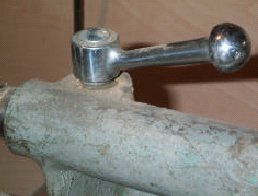 The carriage bolt is secured to the lever by running a nut up the threads and tightening it against the trapped lever. 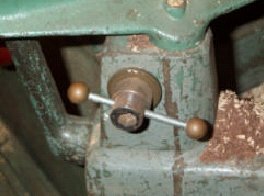 Before torquing down, be sure to allow for a washer thickness between your lever and the tailstock, and be sure that the lever does not overhang the tailstock’s spindle when in the locked position. 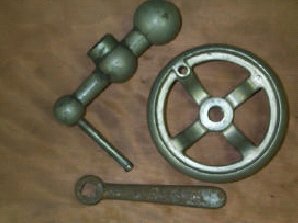 A handwheel or speed crank that is missing its handle can mark the beginning of a bad day. These parts are expensive and sometimes do not always exactly match other handwheels that may also be on your machine. The Burke Mill I purchased had this type problem. The first step here is to find a bolt that either threads into the handwheel or passes through the hole left by the missing spinning handle. Select a bolt long enough to give you three to four inches on the operator-side of the wheel and enough on the backside of the wheel to allow for an acorn nut to lock the bolt/shaft into position. If you need to secure the bolt with an additional nut or threaded sleeve on both sides of the handwheel, allow accordingly. The bolt should not spin and should be able to be firmly attached to the wheel. Now select a chunk of rosewood or cocobolo, bore a hole lengthwise through the blank- sized to allow the bolt to easily pass through it. 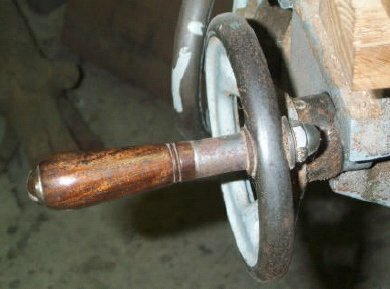 Chuck this on a mandrel on your wood lathe and turn yourself one of the finest-quality spinning handles you’ll ever see. This truly classes up a machine in a woodworker’s shop.